Under a bright June sky in 1979, at the height of the nation’s energy crisis, President Jimmy Carter stood on the roof of the White House to dedicate solar panels installed there to heat water for the staff kitchen. That powerful gesture, which gave America a taste of its clean-energy future, was as symbolic as it was historic: At the time, converting a typical American house to solar power was extremely rare and cost roughly half as much as the house itself. A lot has changed in the intervening 37 years: Solar costs have dropped so much that today it’s possible to generate all or most of a home’s electricity—for decades to come—for about the purchase price of a new economy car. 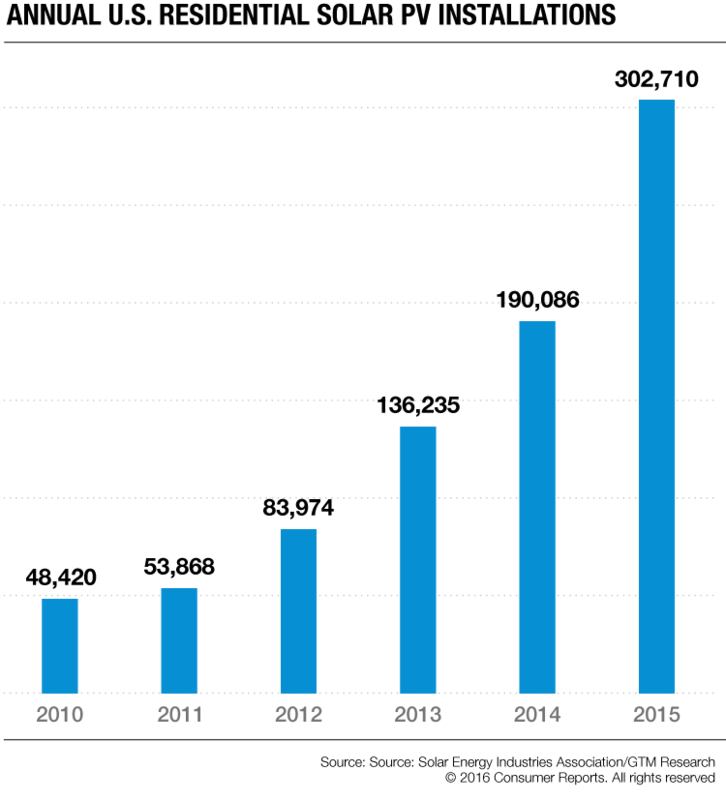 Solar installations have increased dramatically. And President Obama has installed new panels on the White House roof. There has probably never been a better time to switch to solar. Thirty-one states and the District of Columbia have regulations that are solar-friendly enough (and electricity rates high enough) to make residential solar financially attractive (see map below), and last December Congress extended through 2021 the generous federal tax credits on solar projects that had been set to expire at the end of this year. Residential solar installations increased almost 60 percent between 2014 and 2015, and in 2015 America averaged one new residential solar installation about every 100 seconds. Those who want to wait on the sidelines for further price reductions could be disappointed: The cost of solar panels has started to plateau and, while installation labor and other soft costs continue to fall, the phasing out of state tax incentives and utility rebates and grants has largely offset those savings. Adding an element of urgency to the equation are proposals in a number of states that would radically shrink the utility-bill savings of switching to solar power (see “How Utilities Are Fighting Back on Solar Power”). Because, generally speaking, existing solar customers haven’t been subject to those changes, getting your deal done before new regulations are implemented could save you hundreds of dollars each year. Though going solar has never been easier or more affordable, the process is not without its potential pitfalls. For instance, most homeowners who switch to solar power are pocketing just a fraction of what they could be saving because they choose to lease their panels rather than to buy them (see “The Real Cost of Leasing vs. Buying”). 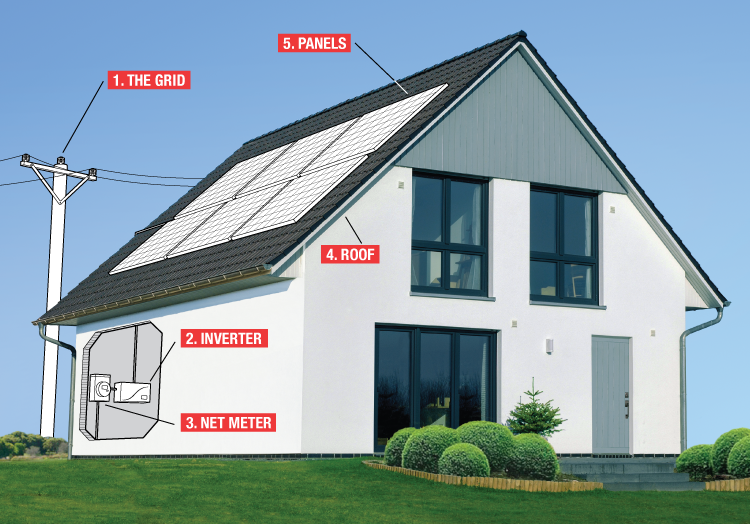 This package will walk you through smart steps of going solar from start to finish, to help you steer clear of common mistakes and increase the chances that your solar future will be a bright one. Whether you find installers through EnergySage or through referrals from friends and neighbors, always check references, ask to see current job sites, and find out how long the company has been in business (a long tenure suggests both experience and the likelihood that the installer will be around in the years to come to stand behind its work). Look for companies that employ installers certified by the North American Board of Certified Energy Practitioners (NABCEP). Uncle Sam will give you a 30 percent credit for the cost of a solar system installed through 2019, scaling down to 26 percent and then 22 percent through 2021. Along with the federal tax credit, you may be eligible for low-interest financing and state and local subsidies for solar costs that can total hundreds of dollars per year (unless you’re leasing, in which case all incentives and tax credits go to the solar company). A reputable solar installer will know about local incentives and how much they can save you. Solar panels can go on any type of roof—from Spanish tile to standing-seam metal, and from wood shakes to asphalt three-tab shingles. Just make sure your installer has experience with whatever roofing you have and will warranty the roof after the job is done (your original roofing warranty will probably be voided by penetrations required for the job). If your roof is likely to need replacing before the warranty of the solar panels ends, plan on spending a couple of thousand dollars at that time to have the panels removed, stored during the project, and reinstalled. If your roof has only five or so years left, consider replacing it before the panels are installed. Solar panel failures are extremely rare, says Joshua Pearce, an engineering professor and solar expert at the Michigan Tech Open Sustainability Technology Lab, who generates 100 percent of his electrical needs on his garage roof. Panel warranties typically range from 10 to 12 years for product defects, which is plenty of time for a rare faulty panel to reveal itself. Pay more attention to the panels’ solar-performance warranty, which guarantees a certain power output for a 20- to 30-year term. (A longer warranty term is better, as is a higher guaranteed output.) “The panel really shouldn’t lose more than ¼ percent to ½ percent in power output per year,” Pearce says. Even more important is the inverter warranty. Some companies will use a single “string” inverter, generally warrantied for 5 to 15 years. Others use “micro” inverters, with one attached to each panel, which are generally warrantied for 25 years but are more costly up front. “Just compare the costs after factoring in $1,000 to $3,000 to replace the string inverter, and go with the more affordable one,” Pearce suggests. Sales reps may boast about “smart” systems, for example, to convince you that their proposal is better than the other guys’. “Ignore the pitch; just go for the lowest cost per watt you can get,” Pearce says. A look at how today’s residential solar systems generate enough power to meet all or most of a household’s electricity needs. 1. The Grid. Homes with solar power remain connected to the grid, drawing power from it at night (and during cloudy weather) and feeding any surplus electricity to it during the day. The goal is to create a system that produces as much energy as you use, for net-zero electrical consumption. 2. Inverter. Converts the DC current generated by the solar panels into AC current, which is then fed to the home’s existing electrical service panel so that it can be used to power household appliances. 3. Net meter. Unlike a standard electric meter, this can run in reverse. You are charged for the power you draw from the grid at night and on cloudy days, but then the meter spins backward to credit you for the power contributed to the grid when the sun is high. 4. Roof. Solar panels work best with little or no shade, in any climate. Any roof shape or material will work. South-facing or flat are best, but east- or west-facing can work, too, particularly in very sunny areas. 5. Panels. Sunlight hits solar panels, freeing electrons in the semiconductor material in their cells. That process generates direct current (DC) electricity. Residential solar power can have a bigger payoff for homeowners in the 31 states highlighted in white and the District of Columbia. Editor’s Note: This article also appeared in the August 2016 issue of Consumer Reports magazine.